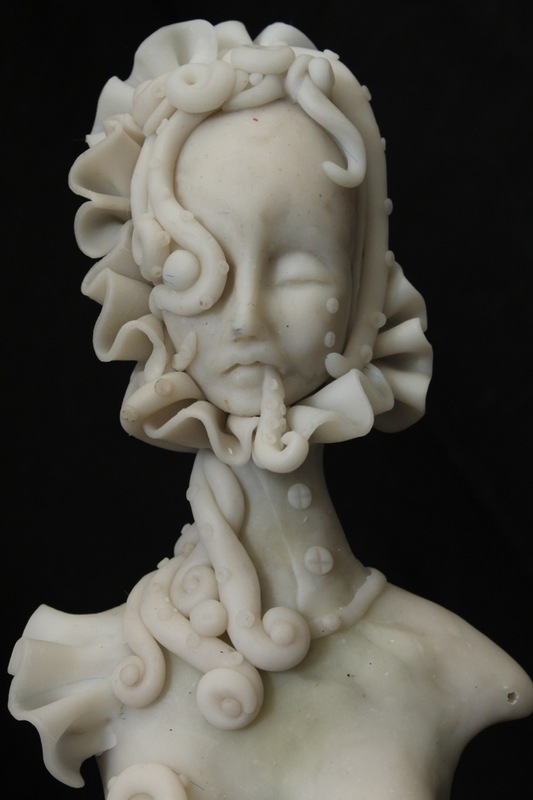 I have recently been commissioned to do a faun/satyr inspired doll. 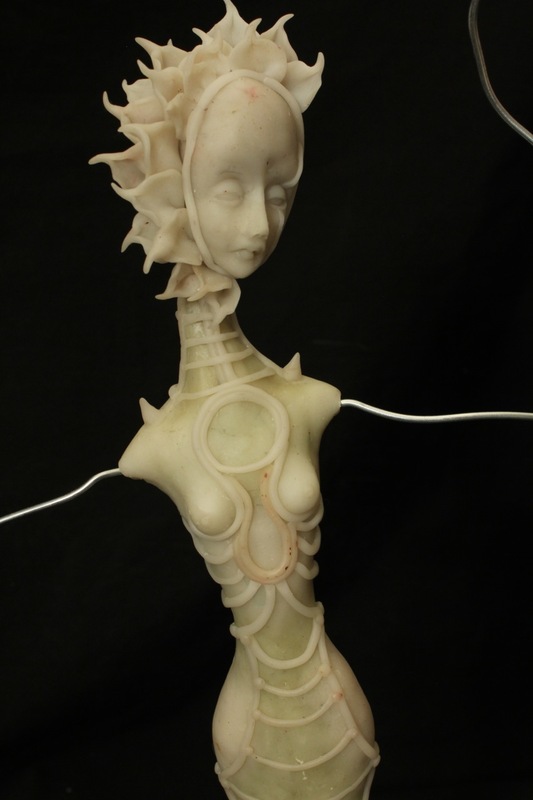 So far this has been a fun project for me and turning out to be my favorite doll that I have made. In fact, I am loving the design so much that I almost think this doll will be an inspiration for my next Ren Fest costume. Here are some work in progress pics from start to where I am at the moment. For the most part her body is done although I am still adding little details such as feathers and flowers. 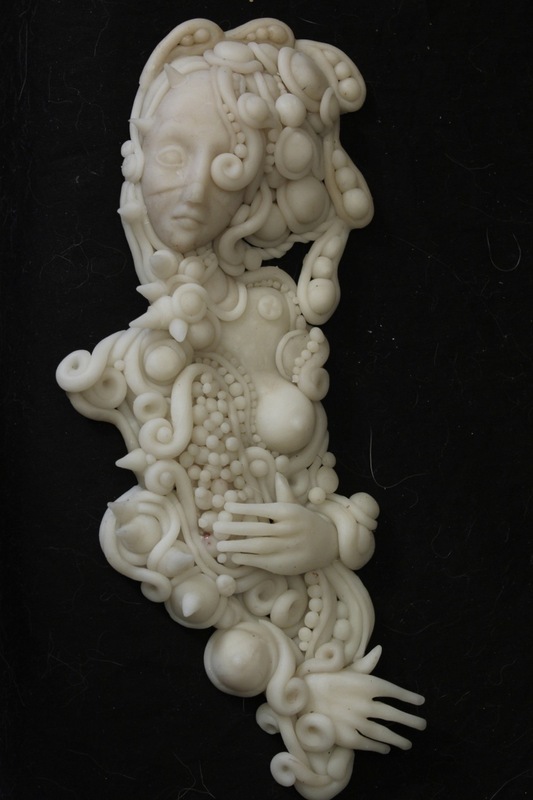 Today I will be painting and decorating her limbs (her feet will be hooves). Hoping by Monday she is assembled and ready for a photoshoot. To see my progress and final product (because I don’t update on my blog as often as I should), please follow Majestic Thorns’ art page. 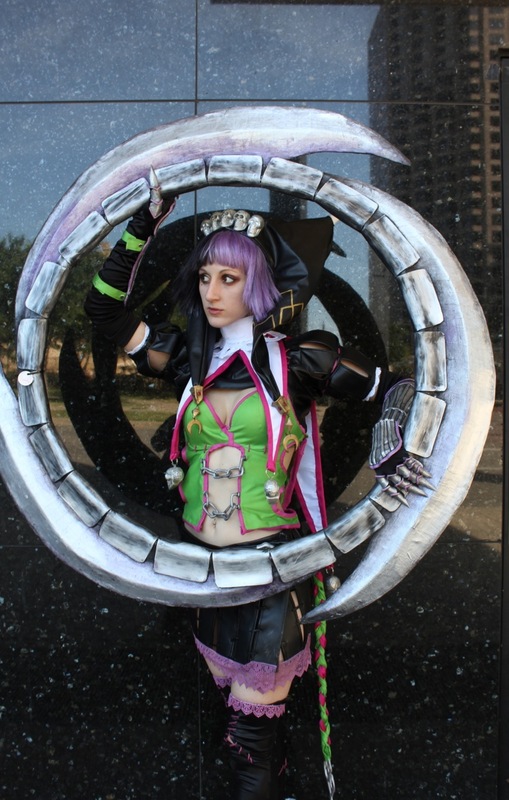 Since I have completed my Tira cosplay, several people have been asking me numerous questions about my process (such as how I made the weapon, and how did I make the gauntlets) so I decided I would do a quick blog in hopes of answering those questions. 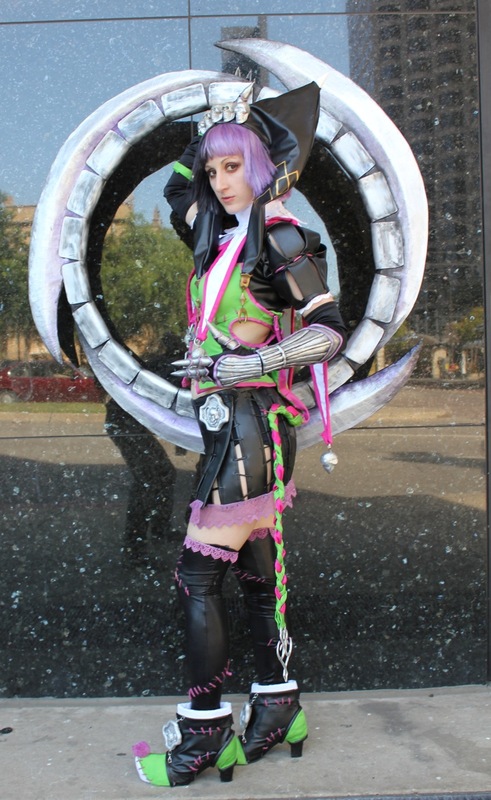 I do not have a step by step tutorial to share however I do have several pictures of SOME of my costume in progress so I hope this helps a little. For the neck piece, I cut out each individual piece from white gabardine fabric as well as lace for the overlay and carefully cut out the heart shape in the middle. I then stiffened the fabrics by using a glue/water mixture. To make the raw edges neater, I decide to sew a lace around the edges. 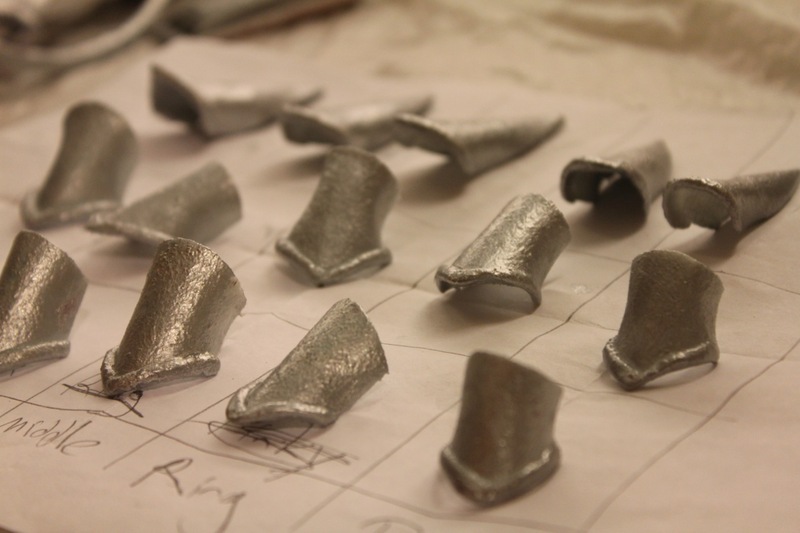 Now for the gauntlets, my favorite aspect of this costume. These were so much fun to wear! These were done using my favorite material, Wonderflex!! I started off by drafting a pattern on paper, then once satisfied with the size and shape, I transferred it onto craft foam. 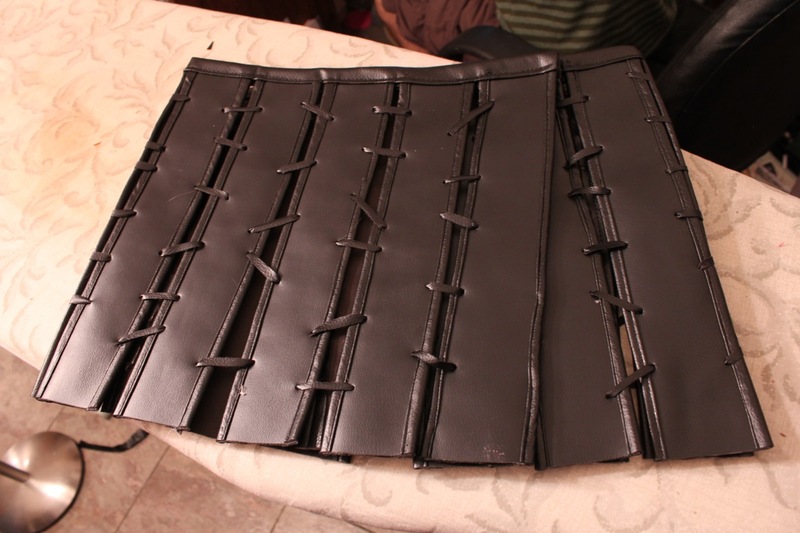 I carefully made sure each finger piece sat in between each joint to allow mobility. I then drew this all out on wonder flex, which is a plastic that is heat activated by use of a heat gun or hot water. 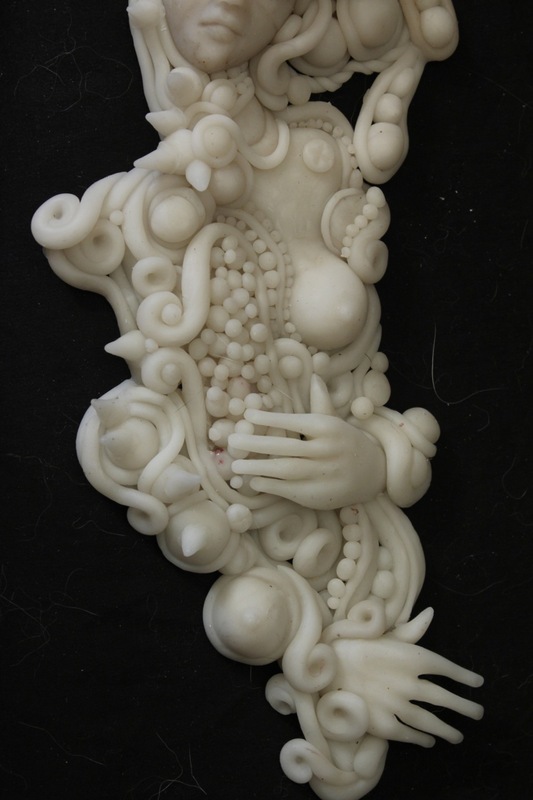 You can then shape it, or cover it over base shape (in this case craft foam) and it will hold it’s shape once cooled. This stuff is surprisingly really strong. I have made pair of wings with this stuff and even with constant slamming into people and doors, they are still in great shape. So this stuff is definitely worth the money. Please keep in mind that it does have a bit of a texture which you can tame down a bit with mod podge although as you can see it’s hard to eliminate it all. I then use silver rub n’buff and black acrylic paint to age it. 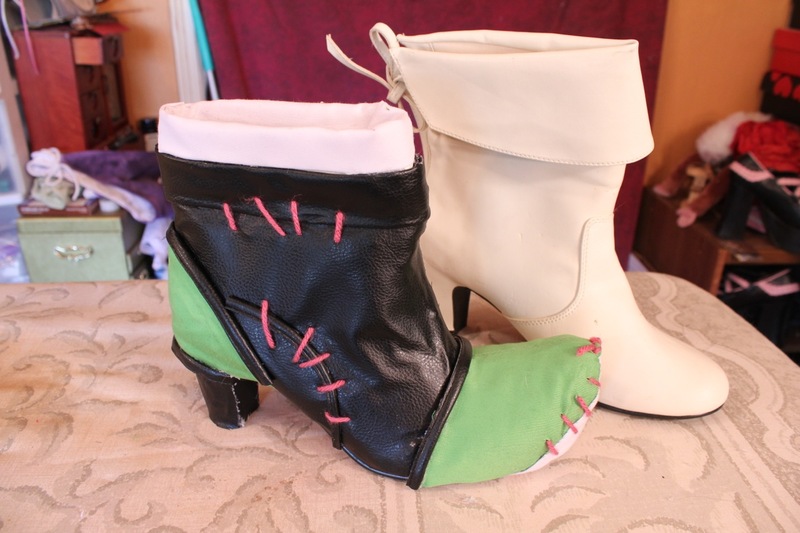 For the shoes, I just sewed on the fabric using green stretch sateen and black vinyl. Not too much to really explain here. All I have is a before shoe and after so I hope this somewhat helps. Afterwards, I added the ball on the tip of the toe area and the chains connecting the skull. (Sorry I do not have a close picture of this). 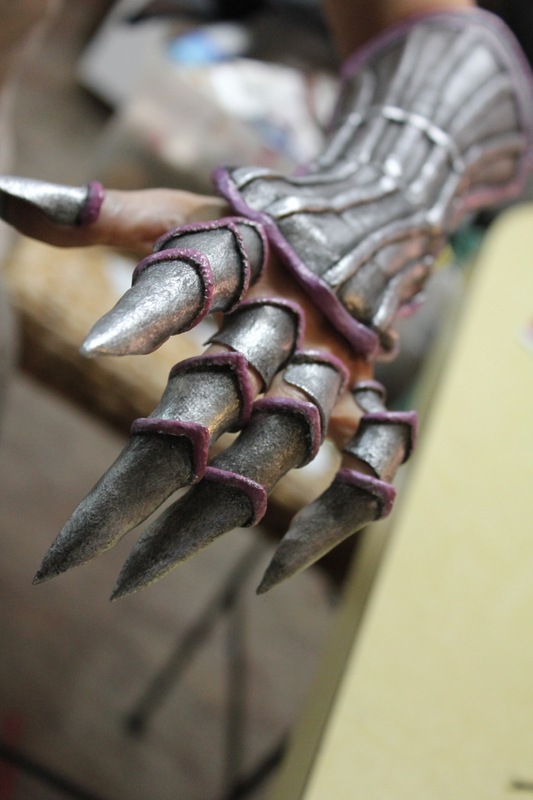 Now for the weapon, my biggest regret of the entire costume. 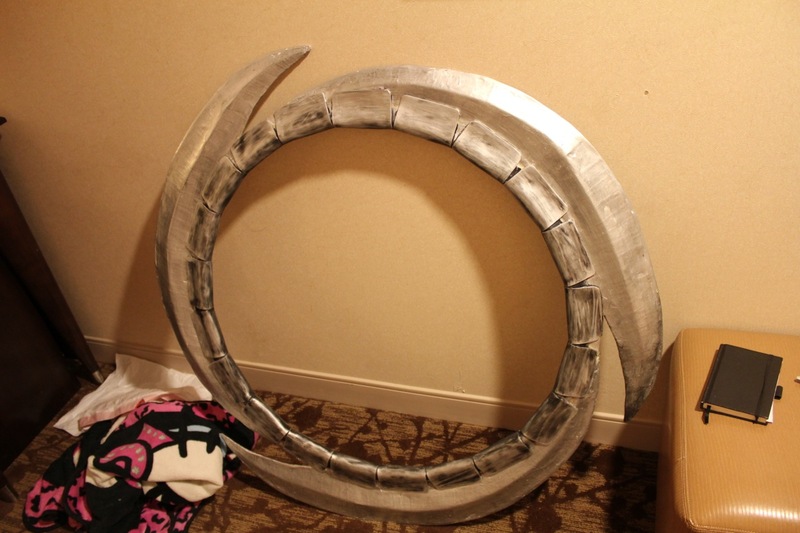 I am not a prop maker. It’s not that I don’t enjoy doing it, but only that I haven’t done too many weapons in the past so my knowledge is lacking a little. Sadly, I made the mistake of doing much of this last minute so I didn’t have much time to do any research on alternate methods. So I ended up sticking with cardboard, and paper mache. I am sure I could have done a much better job but sadly with time ticking away I ended up painting it in the hotel room the day before. 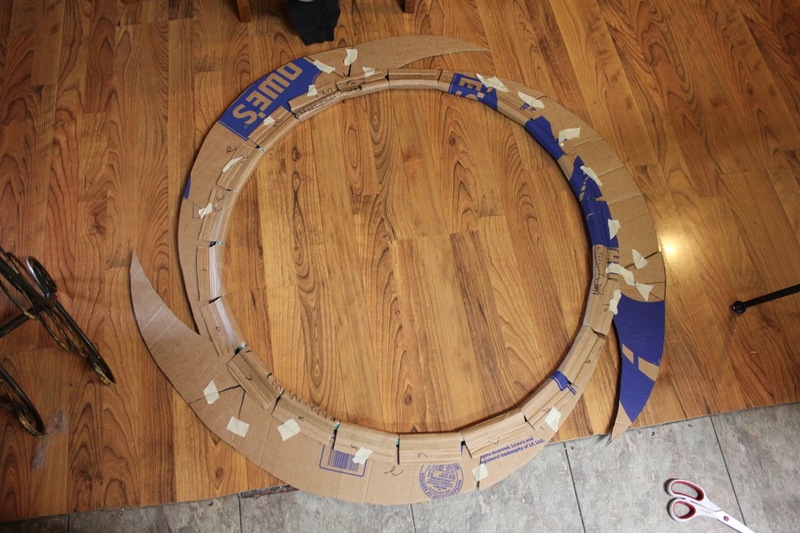 I started off with a hula hoop as my base which I hot glued cardboard pieces around. To get the shape of the blades, I used some plastic styrene. Sadly it was a bit dented up from being stored away in my room. 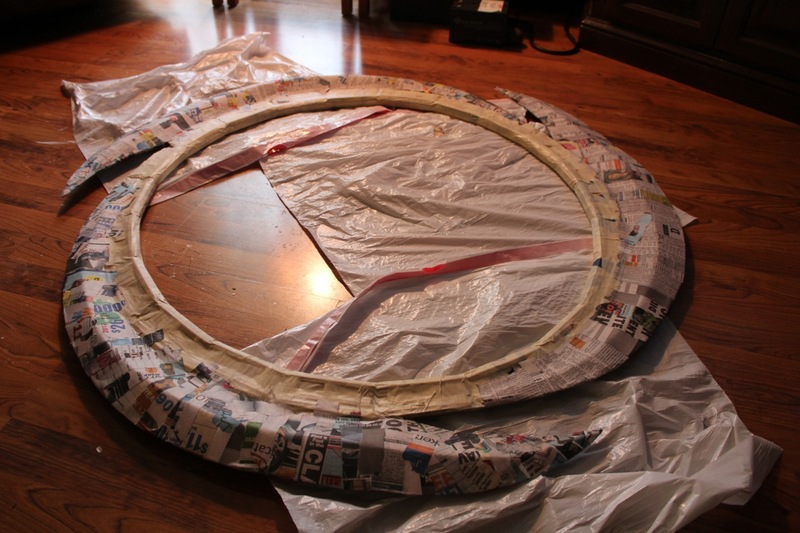 Then began the long, boring process of paper mache. I waited a day between each layer so it took several days before I could finally mod podge the crap out of it. My reason for the mod podge was to get rid of the texture of paper mache however next time I think gesso would be more logical. The mod podge made a far too slick surface and getting the paint to stick was a nightmare. 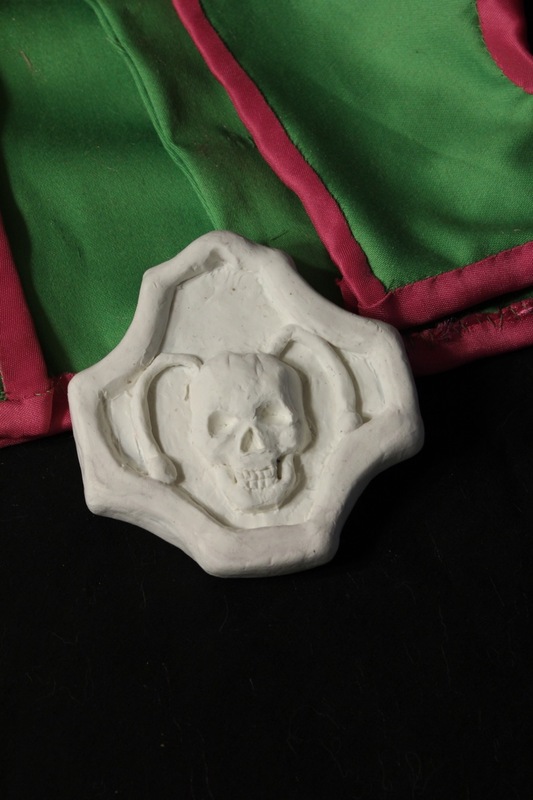 Oh and I forgot to mention that on the edge of the blade I used paper clay to help make a thinner,cleaner edge. 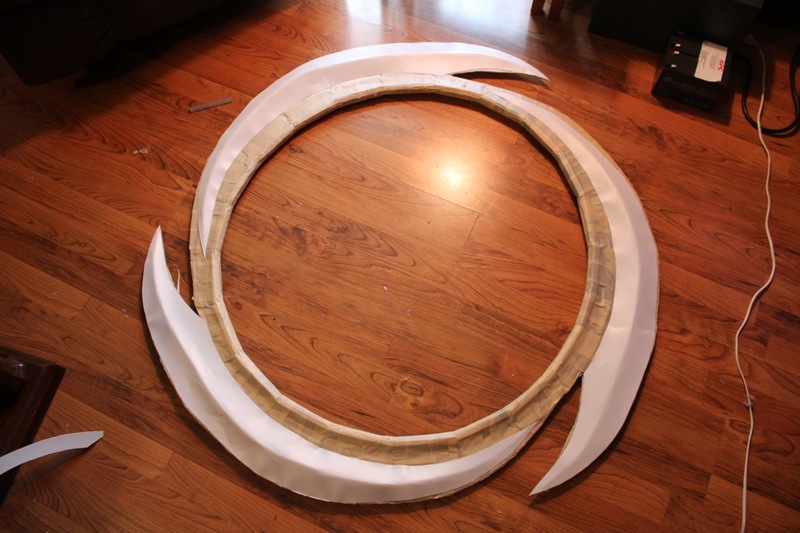 Also, I don’t have a picture but I used Eva foam for the little scales/strips. 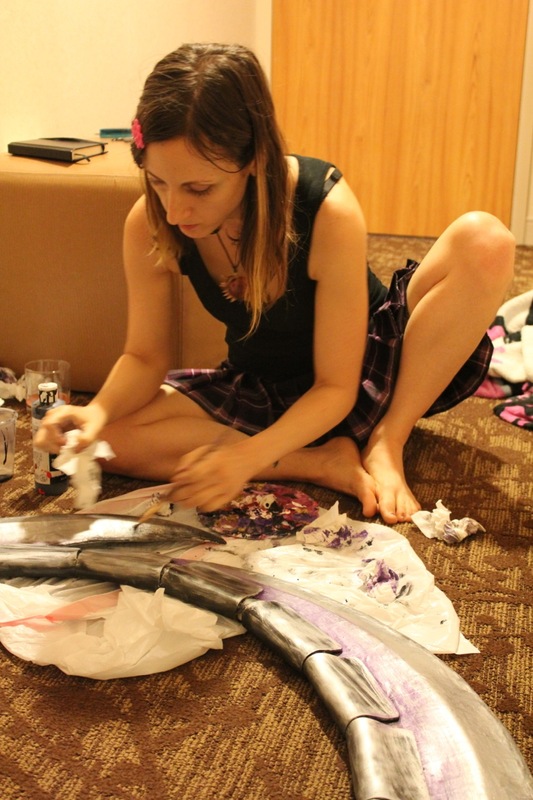 It wasn’t till the first night at the convention I was able to begin painting, so I was a bit rushed. 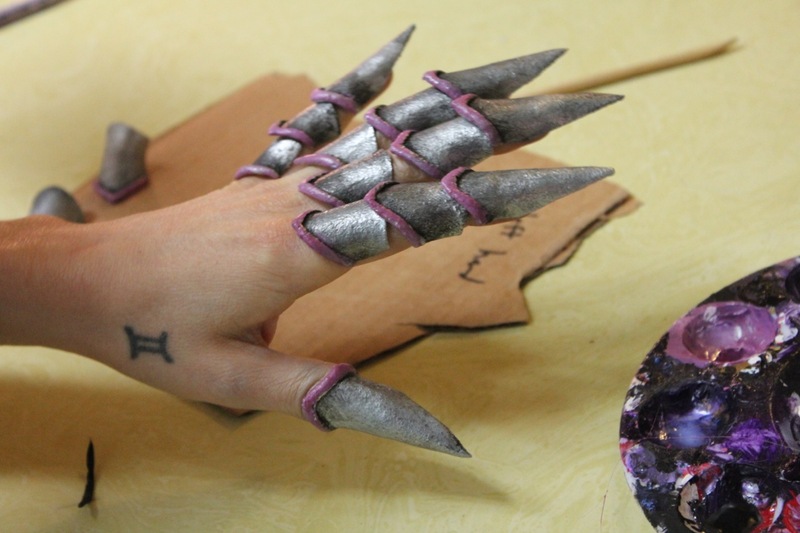 I use rub n buff and then purple and black acrylic paint. I apologize….. these are the only wip pics that I have so if their is something I missed (such as the hat or sleeves) or something you would like to know about other aspects of the costume please don’t hesitate to ask. 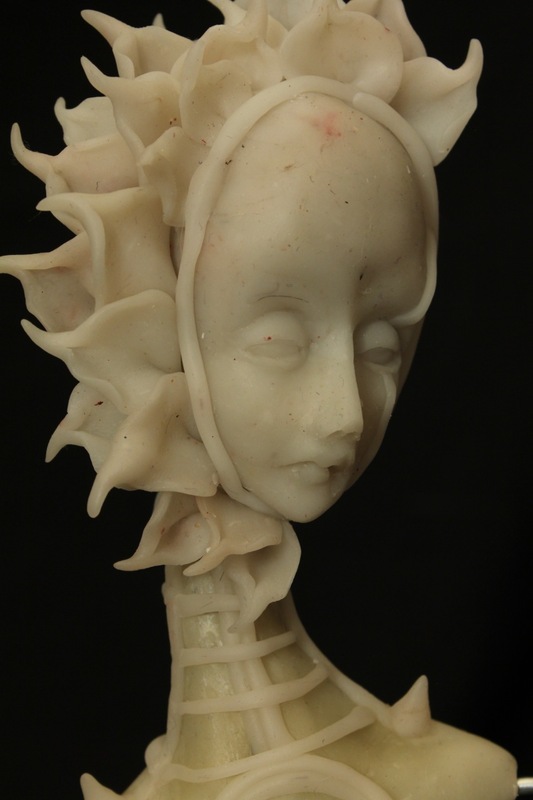 Just a quick post to share my new sculpt, work in progress. 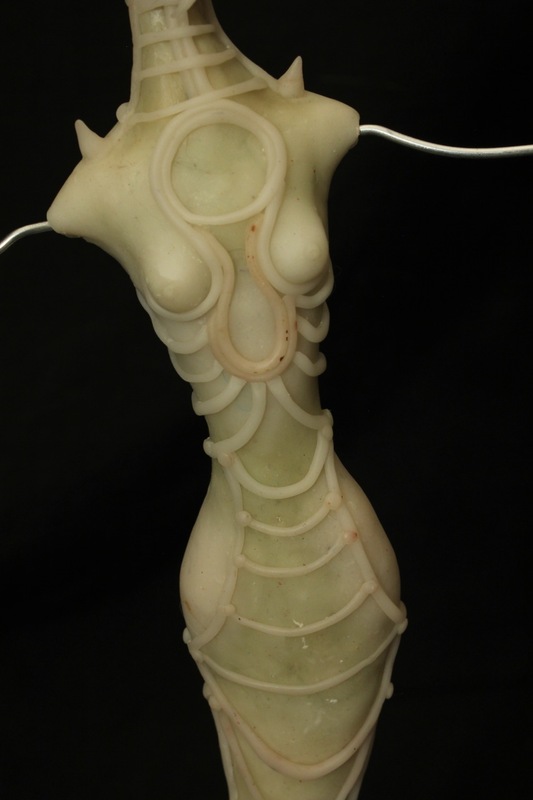 Here are two new pieces that I am working on. The first one is going to be a wall piece. During my last semester in college I did several wall pieces in my ceramics class, and I absolutely loved the results that I came out with, so I was inspired to go back and experiment with the idea again. Unfortunately, I sold the pieces without being able to take any descent pictures of them, so now I am giving myself a chance to document the process. So far this is what I have done. 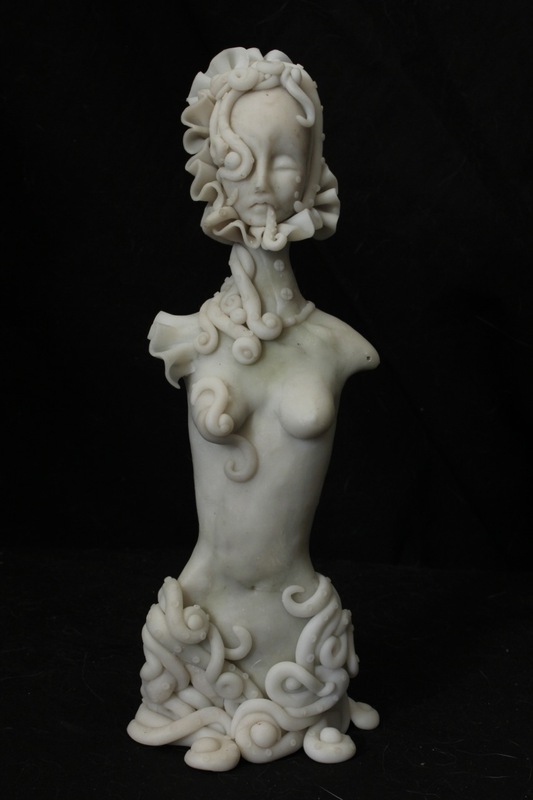 This next one was created with the intention of becoming a full doll with slightly posable legs and arms much like my other ribbon jointed dolls however in the end she became just a static sculpture (although I may still give her arms). It seems when I am working my plans almost always change drastically which is why I almost just gave up completly working from a planned idea or sketch.